The Rose Bowl is in the rearview mirror. What’s next for the Washington Huskies? Before they host Eastern Washington in the season opener Aug. 31, Chris Petersen’s crew needs to get through 15 spring practices, the first of which kicks off at 8:30 a.m. Wednesday. There will be no shortage of new starters and position competitions, primarily on the defensive side. It’s true, you can only learn so much in April. But why should that stop us from trying? 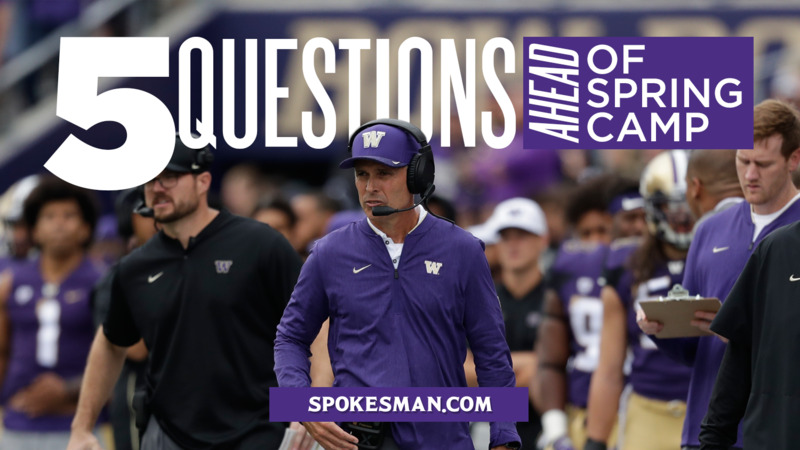 Here are five questions the Huskies are trying to answer this spring. Is this Jacob Eason’s season? Maybe you’ve heard of the kid. A 6-foot-6, 227-pound junior from Lake Stevens, Washington, Eason was ranked by 247Sports as the No. 4 overall prospect in the 2016 class. He signed with Georgia and immediately ascended to the starting spot, completing 55.1 percent of his passes and throwing for 2,430 yards with 16 touchdowns and eight interceptions. But after injuring his knee in the 2017 opener, Eason was overtaken by five-star freshman Jake Fromm, and after the season he opted to transfer back to his hometown team. Following a NCAA-necessitated redshirt season, Eason is an FBS starting quarterback again. But will he finally fulfill his five-star ranking, or will his highly anticipated homecoming fall short of expectations? Those answers, of course, won’t be available until the fall. For now, though, we can focus on Eason’s command of the huddle, on his chemistry with UW’s inconsistent crop of receivers, on his understanding of the playbook and willingness to lead an experienced offense (and, it almost goes without saying, on the shotgun welded onto his right shoulder). Will Salvon Ahmed grab the running back reins? Salvon Ahmed’s athleticism has never been in question. The 5-foot-11, 195-pound junior ran a 4.32-second 40-yard dash at the Husky Combine last month, easily topping the team. As a complement to established starter Myles Gaskin, he averaged 6.0 yards per carry and rushed for 996 yards and 10 touchdowns in his first two seasons in Seattle. Still, all that athletic talent doesn’t guarantee that Ahmed can effectively replace Gaskin, who exceeded 1,200 rushing yards and 10 touchdowns in each of his four memorable seasons on Montlake. Ahmed will get the first opportunity to prove he can operate as a feature back, but UW also has plenty of available options competing for significant snaps. Junior Sean McGrew, for example, contributed 226 rushing yards and 4.5 yards per carry last season. Fellow junior Kamari Pleasant added 5.1 yards per rush. Richard Newton showed promise in practice but redshirted his freshman season while nursing a shoulder injury. And don’t forget, either, that four-star freshman Cameron Davis will arrive this summer. All things considered, Ahmed deserves to be the front-runner in the running back room. But it will be worth noting how he handles that role and how UW fills out its backfield rotation around him. Can Junior Adams transform the UW wideouts? The bad news: UW only had three legitimate contributors at the wide receiver position last season in juniors Aaron Fuller (58 catches, 874 yards, four touchdowns) and Andre Baccellia (55, 584, 0) and sophomore Ty Jones (31, 491, six). The good news: Fuller, Baccellia and Jones are all back this fall. But will they be better? And who else can lend a pair of hands? The hope for Eason and UW offensive coordinator Bush Hamdan is that the talented trio of highly touted redshirt freshmen Marquis Spiker, Austin Osborne and Trey Lowe will emerge this spring and fall. It will also be interesting to keep tabs on sophomore Terrell Bynum, who has yet to catch a pass but registered an impressive 4.48-second 40-yard dash at the Husky Combine. Top recruit Puka Nacua will also enroll in classes in Seattle this summer. It’s first-year wide receivers coach Junior Adams’ job to develop his new cast of relatively unproven players. Adams – whose previous stops include Western Kentucky, Boise State and Eastern Washington – has earned the reputation of an effective teacher, and he’ll have plenty of pupils to positively impact this spring. How do you replace Burr-Kirven and Bartlett? Classmates and freshman roommates Ben Burr-Kirven and Tevis Bartlett combined for 45 starts, 496 tackles, 37.5 tackles for loss, 13 sacks and six interceptions in their prolific four-year careers. Burr-Kirven, specifically, dominated in the middle of the Husky defense last season, piling up 176 tackles, 5.5 tackles for loss, four forced fumbles, three fumble recoveries, two sacks and two interceptions en route to being named Pac-12 Defensive Player of the Year. So where does inside linebackers coach Bob Gregory go from here? It’s unlikely he’ll find another Burr-Kirven any time soon, but Brandon Wellington should be ready to start in his senior season. The former Eastside Catholic standout rebounded from a torn ACL late in 2017 to contribute eight tackles in the 2018 Apple Cup and seven tackles and a tackle for loss in the Rose Bowl. With senior D.J. Beavers’ status murky at best following a lower-leg injury suffered in the Rose Bowl, expect a handful of Huskies to compete for the other starting spot. Senior Kyler Manu, redshirt freshmen M.J. Tafisi, Jackson Sirmon and Edefuan Ulofoshio and true freshman early enrollee Josh Calvert will all fight for starting snaps this spring. True freshmen Daniel Heimuli and Alphonzo Tuputala will also join the fun this summer. That’s a lot of options and few answers. One of UW’s most emphatic question marks resides in the middle of its inexperienced defense. Who will emerge opposite Taylor at cornerback? One of these spots has basically been decided. As long as he stays healthy, 6-2, 200-pound junior Keith Taylor – who led the Pac-12 by allowing just 0.51 yards per coverage snap last season, according to Pro Football Focus – will be a starting cornerback this fall. Opposite Taylor, though, the intrigue awaits. Freshmen Kyler Gordon, Dom Hampton and Julius Irvin all impressed behind the scenes throughout their redshirt seasons and should compete for starting snaps. Gordon stole the spotlight at the Husky Combine, finishing first in the vertical jump (42.5 inches), second in the 3-cone drill (6.52 seconds) and pro agility drill (3.87 seconds) and third in the broad jump (10 feet, 5 inches). Kamren Fabiculanan also joins the cornerback jamboree this spring and highly touted freshman Trent McDuffie will be added to the mix this summer. Meanwhile, the Huskies should be set in the slot, with standout nickelbacks Myles Bryant and Elijah Molden both returning. Add it all together, and what do you get? Answer: a group with relatively little experience but tidal waves of talent. This competition should be fun to watch. Published: April 2, 2019, 6:02 p.m. Updated: April 2, 2019, 6:20 p.m.